Frisco Colorado Real Estate offers many options for mountain townhomes. Whether it is a townhome a short walk from Main Street and Lake Dillon or a spacious townhome steps from biking and hiking trails, you will find exceptional townhomes for sale in Frisco, Colorado. In Frisco Colorado Real Estate the townhomes for sale at Pointe at Lake Dillon are steps from not only Lake Dillon but also the Summit County recreation path for biking, running and more. These Frisco townhomes can be found off of Dillon Dam Road and Beaver Lodge Road. There are 24 total units each having a 1 or 2 car garage. 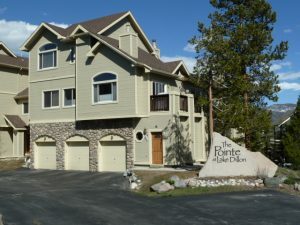 Currently there are two Pointe at Lake Dillon townhomes for sale and one under contract. There are only 10 three bedrooms in the complex. The two Frisco townhomes for sale are listed for $424,000 for 1,792 square feet and $435,000 for 1,642 square feet. Each Pointe at Lake Dillon townhome for sale have 3 bedrooms/3 bathrooms with a 1-car garage and come unfurnished. To arrange a showing of either of the Pointe at Lake Dillon townhomes currently listed contact Krystal Knott with LIV Sotheby’s International Realty. I am happy to provide you with details on previous sales, market data and more. With over 10 years of full-time experience as Summit County Realtor, let me put my knowledge to work for you, we can’t wait to hear from you. Call us at 970.333.0116 to discuss your personal property criteria or search all Summit County Real Estate online today. This weekend is the 6th annual downtown Art Festival in Frisco Colorado being held both Saturday and Sunday, August 11-12, 2012. Located on Frisco’s Main Street and being held from 10am – 5pm both Saturday and Sunday. The Art Festival in Frisco Colorado is considered one of the top art shows in the country. Browse and purchase items such as glass art, hand made jewelry, wood workings, paintings, sculptures, photography and much more. 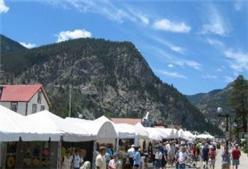 Enjoy a lovely summer day in the rocky mountains at the Art Festival in Frisco Colorado this weekend. If Frisco Colorado is a place you visit often why not consider looking at what is for sale in Frisco CO Real Estate? Krystal Knott with LIV Sotheby’s International Realty can assist you with Frisco CO Real Estate or any property for sale in Summit County. Let me put our expertise and experience to work for you, call me at 970.333.0116 or start your search online today!